I’ve tried to love it, but all I can muster is like. …ption. I’m disappointed in two shows I was very excited about. Utopia was the subject of the post before this one. I’m now post film festival, post holiday and post annoying-period-of-getting-back-in-the-routine-of-actual-life. I picked up Utopia on All4 at episode four this week and found myself a little bored. It certainly maintains the astonishing sense of style but I find it hard to care about the characters, particularly Fiona O’Shaughnessy as Jessica Hyde whose performance falls into off-putting rather than off-kilter, as I think it needs to be. And characters maketh the program. 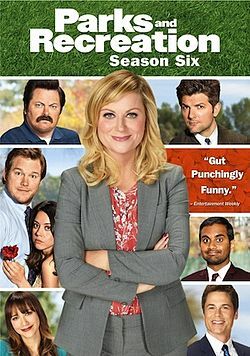 My other main disappointment was Parks and Recreation Season 6, which certainly has no problem with characters. Each one seems to be born of acute observation and is brought to life by very talented performers. But by season 6 the writers seem to have given up going to anywhere dark or interesting with this ensemble full of potential. The frustrating thing is that this lack of dramatic ambition is paired up with consistently excellent, and sometimes exquisite, joke writing. I think I now see what happened with Brooklyn Nine Nine – they saw the successful formula of later Parks & Rec, with a collection of quirky characters in various pairings each episode and simply made a facsimile, forgetting the four or five seasons of groundwork to make the characters into real people. Maybe I’m asking too much of a network sitcom. I only do this because I am certain they could have achieved more. Season 7 could prove me wrong. But I’m not hugely motivated to watch it. Please let me know if you disagree with my analysis or wish to prove me wrong with your clever words and thoughts. It’s not all doom and gloom – BoJack Horseman Season 2 (on Netflix now) exposes the turmoil and angst of existence while being hilarious. WITH EXQUISITE PUNS EVERYWHERE. And Agent Carter (on Fox UK, Sundays at 9pm) is avoiding formula and leaving no easy choices for the main characters in what could have been a bland network “superhero” drama. So, basically all is not lost. PS For those of you disappointed in me for the lack of podcast… I apologise. But it is coming. I don’t necessarily agree about P&R season 6, but you should definitely watch 7 anyway, as it is a totally different kettle of fish! I’m sure I will catch S7 at some point. I’d love to hear a different take on Season 6 if you’d care to elaborate? Thanks for a well written piece – haven’t got to p&r s6 yet but will be prepared! Will seek out utopia and couldn’t agree more bojack wise – for me just a sublime watching experience! Hmm, well I wouldn’t call it a different take, but for me it was essentially cruising (character development-wise) since season 4. I though season 6 was a return to form in terms of pure jokes though. Some of the Pawnee ‘characters’ reached their full joke potential – particularly Councillor Jamm, Joan Calamezzo and Perd Hapley. But I’ll admit the success of humour of those characters is not through characterisation at all, in fact developing them would probably make them less funny.